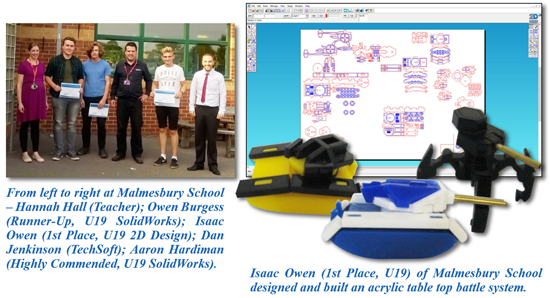 In the last edition we announced the winners of our SOLIDWORKS competitions. This time we take a look at the winners of the 2D DESIGN competitions for 2016 and show some of the high quality work that they produced. 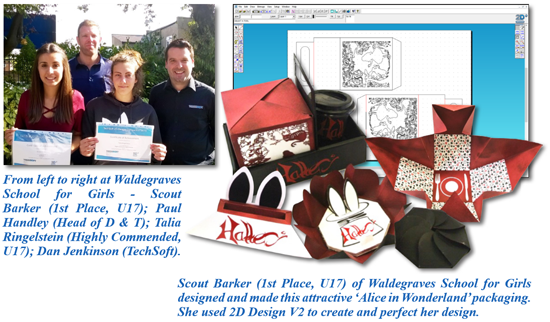 in Twickenham with her ‘Alice in Wonderland’ brand packaging.  Scout used 2D Design in a variety of different ways to find a solution to the design brief of creating ‘a brand new fast food brand with relevant and appropriate packaging’. She was able to accurately produce geometry for nets using various contouring, mirror and repeat routines. She then output these nets to a CAMM 1 knife cutter. She created vinyl and other decorative parts for the packaging and also laser cut ‘Alice in Wonderland’ panels and packaging boxes. in Wiltshire. He used 2D DESIGN to produce a complex push fit range of gaming accessories for the popular Warhammer. He accurately produced contoured push fits, as well as detailed slots. His 2D DESIGN layouts showed an exceptional eye for details, lay planning and an ordered CAM output to reduce the amount of time taken to manufacture his prototype pieces. The geometry was very well planned, with the design clearly showing how 2D DESIGN can be used to create a full 3D dimensional product from a set of 2D parts. 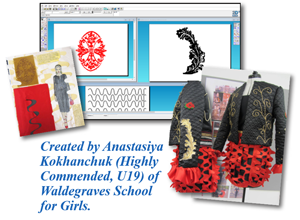 No prizes here, but special mention should also go to Anastasiya Kokhanchuk, Sarah Malloy and Siddy Nichols, all from Waldegrave School for Girls in Twickenham who impressed the judges with their clever use of 2D Design to enhance her Fashion and Textiles projects. Materials laser cut and engraved definitely add that little bit extra to these projects. Other entries of note came from Whitburn Church of England Academy in Sunderland and Tunbridge Wells Girls Grammar School so congratulations to them too. In fact, congratulations to all our entrants. Design & Technology is at, some might say, a crossroads. There have been some difficult times, and some difficult decisions, that have been made in recent years. But regardless of this, what we cannot hide is the enthusiasm and inventiveness of our future designers and engineers. You just need to take a look at our entries to realise the depth of talent coming through the UK education system. If you have talented students who you think should be entered into our 2017 competitions, then details are on our website at www. techsoft.co.uk/Competitions.